Puja Navarathna *Exclusive Offer Free Home Automation or Kitchen Cabinets offer lasts 30th September 2018* SRR MARKETING is a leading CRISIL rated. Real Estate consultants, operating from Basavangudi. We are marketing 200 Apartment projects, Properties located in Basavangudi, Chamrajpet, Hanumanthnagar, Jayanagar, Banashankari, Gubbalala, Uttarahalli, and Sarjapura Road, We are exclusively marketing 9 projects in Wilson Garden, BSK 2nd Stage, BSK 3rd Stage, Jayanagar, Sarjapura Road and Hanumanthnagar. SRR Marketing is one of the pioneer names in Bengaluru Real Estate segment and with over decade of service excellence SRR Marketing has bestowed its clients and customers with clear title and genuine housing projects in and around Bengaluru. For more updates on project, visit www.srrmarketing.co.in or call 9980077897/080 41263897 SRR Marketing now introduces Puja Navarathna low rise residential project comprises of exclusive 2 & 3 BHK apartments that is perfectly located on Sarjapur Main Road. Puja Navarathna situated in the heart of Bangalore IT corridor, just 2 kms from Wipro corporate headquarters. It is located in close proximity to best International schools, educational Institutions, world class hospitals and malls. For best real estate services, visit www.srrmarketing.co.in. A home in Puja Navarathna has all the amenities to give your life comfort and pleasure. Top class restaurants and other conveniences just a stone throw away. To book apartment in Puja Navarathna call 9980077897. Each apartment is built by a team of highly experienced and dedicated professionals that is coupled with impeccable quality and attention to detail. 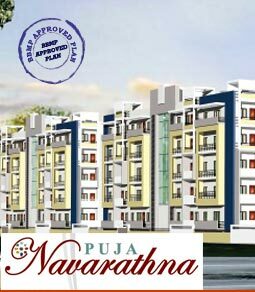 Based on the apartment’s location quality and comfort Puja Navarathna is one most desired place to live and invest! Puja Navarathna Features: 	Total Area - 55000 Sq.Ft 	Total Number of Flats: 135 	2 BHK & 3 BHK Luxury Flats 	East & West Facing Apartments 	A Khatha Apartments 	BBMP Approved 	Loans from All Leading Banks 	Vastu Compliance 	Big Balconies Puja Navarathna Location Benefits: 	1 Km from Wipro 	2 Minutes Drive from RGA Tech Park 	2 Minutes Away from Decathlon 	15 Minutes Drive from RMZ Ecospace 	5 Kms from Cessna Business Park 	1 km from carmelarm Railway station and Bus stop 	500 meters to Doddakannelli Junction For more updates on Puma Navarathna on Sarjapura Road, sale queries and free visit call 9980077897. For latest updates on flat, plot and commercial properties sale visit www.srrmarketing.co.in.